This item crafting script is modeled after the crafting system implemented in the PSP remake of Tactics Ogre: Let Us Cling Together. It’s a very simple crafting system with a very simple GUI which I also used as a model. Players must have recipe books in their inventory when entering the crafting scene. Any recipe books owned by the player will be displayed in a list. When a recipe book is selected, all possible items, armors, and weapons in the recipe book will be listed and you will be able to craft them provided that the player has the necessary ingredients. The script Info Pages Window is required. Feel free to reguest custom information to be added to item info pages in the crafting scene. Bugfix: Fixed ingredient numbers in info window. New tag: <craft result>. See comments for more info. You can now run a common event after crafting an item. Now requires script: “Info Pages Window”. This script will now check if any required scripts are missing. If any are missing, the game will be exited. Many crafting customization options related to the info pages window have been removed. $imported variable now uses version number. Changed some methods, add-ons/patches may not work anymore. Bugfix: Custom craft result sound effects should no longer crash the game. Equippable members info page added. You can now require specific actors in the party as a crafting requirement. New options in the customization module added. TP Recovery now displays the correct value. State resistance item info is now viewable. You can now view item details in the crafting scene if the script “Reader Functions for Features/Effects” is installed. Info window style has changed. Any amount of ingredients can now be displayed, not just 6. Configuration module has many new settings. Some method names have changed. Removed a chunk of redundant code. Fixed issue where you can still craft from a recipebook even if you have zero left as a result of using it in a crafting recipe. Script call for the crafting scene has changed. The old one can still be used though. You can now choose which recipebooks can be included in the crafting scene by category. New Notetag for recipebooks added. You can now change the recipebook pictures directory. You can now assign sound effects for crafted items. Added the option to use images as recipebook covers. Colon between type and ID no longer needed. Updated comments to reflect changes. You can now change the Gold icon in the customization module. Fixed issue with long item names getting cut off in windows. Note: Some tags are given shorter tags for typing convenience. You only need to use one <tag> from a given group for a notebox. Use common sense. This setting defines the items that can be crafted from the recipe book where id is the Item ID number found in your database. You can list multiple id numbers on the same line separated by commas. This setting can be used multiple times within the <recipebook> tags. This setting defines the weapons that can be crafted from the recipe book where id is the Weapon ID number found in your database. You can list multiple id numbers on the same line separated by commas. This setting can be used multiple times within the <recipebook> tags. This setting defines the armors that can be crafted from the recipe book where id is the Armor ID number found in your database. You can list multiple id numbers on the same line separated by commas. This setting can be used multiple times within the <recipebook> tags. 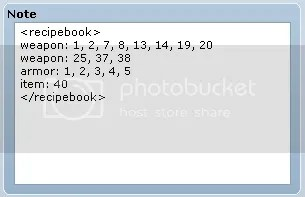 This setting defines the image used to represent the recipe book in the crafting scene where filename is the name of a picture located in the Graphics/Pictures/ folder of your project. Do not include the filename’s extension. Recommended picture resolutions are [width: 248, height: 320] for default resolutions and [width: 296, height: 384] for 480×640 resolutions. This setting defines the recipebook’s category label. Category labels are used by developers to determine which recipebooks they want included in the crafting scene. If a category label is not defined, the default category is “none”. This is a completely optional setting. This setting defines the item ingredients required to craft the item, weapon, or armor where id is the Item ID number found in your database. xN is total number of that ingredient required if it is included after the id number where N is a whole number (ex. x2, x3, x4, etc.). If xN is not included, the script will automatically assume x1. You can list multiple id numbers on the same line separated by commas. This setting can be used multiple times within the <ingredients> tags. This setting defines the weapon ingredients required to craft the item, weapon, or armor where id is the Weapon ID number found in your database. xN is total number of that ingredient required if it is included after the id number where N is a whole number (ex. x2, x3, x4, etc.). If xN is not included, the script will automatically assume x1. You can list multiple id numbers on the same line separated by commas. This setting can be used multiple times within the <ingredients> tags. This setting defines the armor ingredients required to craft the item, weapon, or armor where id is the Weapon ID number found in your database. xN is total number of that ingredient required if it is included after the id number where N is a whole number (ex. x2, x3, x4, etc.). If xN is not included, the script will automatically assume x1. You can list multiple id numbers on the same line separated by commas. This setting can be used multiple times within the <ingredients> tags. This setting defines the amount of Gold required to craft the item, armor, or weapon where amount is any amount of gold. If this setting is omitted, it will use the default fee defined in the customization module. This setting defines the tools required to craft the item, weapon, or armor where id is the item, weapon, or armor ID number found in your database. Tools are not consumed in the crafting process. This setting can be used multiple times within the <ingredients> tags. This setting defines the actor required to craft the item, weapon, or armor where actor_id is the actor ID number from your database. Currently, nothing happens to the actor after crafting an item that requires one. This setting can be used multiple times within the <ingredients> tags. This setting defines the custom sound effect played when the item is crafted. filename is a sound effect filename found in the Audio/SE/ folder. volume is a value between 0~100. pitch is a value between 50~150. If this setting is omitted, the default crafting sound effect defined in the customization module will play instead. This setting defines the amount that is produced from one set of ingredients, where n is a number. 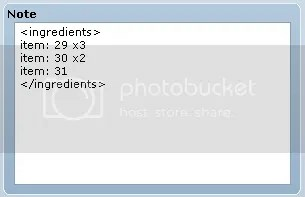 By default, the amount produced from one set of ingredients is 1. This setting defines a common event that runs right after an item is crafted where id is a common event ID number from your database. It is important to know that Note boxes have iffy word wrap distinction. If a line is too long and overflows into the next line, that next line might be treated as a new line in the Note box. To stay on the safe side, if you have a long list of ids for a single item type setting, you should start the line with the similar type setting. See the “weapon:” settings in this example tag. Each ingredient id must be on its own line, unlike the recipebook tag. 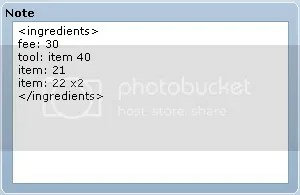 More than 6 ingredients are possible, but the Required Ingredients window will not display more than 6. The last setting tag “item: 31” does not have an “xN” multiplier which means the script will automatically assume “x1”. This tag is an example of how to use the “fee” and “tool” setting tags. Item ID 40 is required to craft the item, but it will not be consumed. Each item crafted costs 30 gold. The following script calls are meant to be used in “Script…” event commands found under Tab 3 when adding a new event command. This script call opens up a Tactics Ogre Crafting scene with all recipebooks the player has in their inventory. This script call opens up the Tactics Ogre Crafting scene with only recipebooks that have the category included in one of the script call’s arguments. You can list as many categories in the script call’s arguments separated by commas as you like. Category names must always be preceeded by a colon (:). This script call will open up the crafting scene with only recipebooks that have the category of “smithing”. Why am I allowed to craft items that have no required ingredients? This was done on purpose to ease game development. I assumed that when people finalize a game, they will have an appropriate list of ingredients for each craftable item defined by then. Can an item/armor/weapon have a <recipebook> tag AND an <ingredients> tag? Why isn’t “Success Rate” also implemented in this script from Tactics Ogre PSP? Because I think Success Rate on crafting in single-player games is annoying and pointless due to save and load. But if there is demand for it, I can implement it. Script ‘Tactics Ogre PSP Crafting System’ line x: NameError occurred. Place the crafting script BELOW the Info Pages script in your script editor list. There are no default method overwrites. Requests for compatibility with other scripts are welcome. Use v1.14 of the crafting script or higher. Install the crafting script ABOVE the Menu Delux script in the Materials section of the script editor. Change the strings to anything you want. Change 16 to any icon index number you want. If you get a syntax error, it means you forgot a comma after one of the arrays in MENU_LIST. Please do not repost this script elsewhere without permission. Free for non-commercial use. For commercial use, contact me first. I like your crafting script. However I would like the ingredients to dissappear from your inventory after crafting. is there anyway I could do this without scripting or do i need a script for that? I’m not sure what to do here and it’s actually rather annoying. It doesn’t seem to do that with any of the other games I’m making. I would appreciate a speedy reply as I’m eager to test a few things I’m working on. Thank you in advance. Actually, I just tried it by making a new game entirely. It seems the script continues to fail even though it’s a completely new project. My mistake. Hi again. Sorry for spamming messages, but I’ve finally figured out what was wrong. I was placing the tag in the wrong place. Apparently I was supposed to put it inside of the tags and I was putting it after. So, sorry about all that and… problem resolved. for some reason i only get flat HP and MP restore not the % restore, anyway of fixing this? hello! i am using your script in tandem with a runic enchantment script, and i was wondering, is there a way to prevent items that have runes inscribed on them from being crafted and/or have any inscribed runes returned to inventory after upgrading (crafting) has taken place?